Professor Anthony Kwame Ahiawodzi, is the current President of the Knutsford University College. As President, he is the Head of the Academic and Management Team of the University College. He also serves as the Chief Disciplinary Officer of the University College. Professor Anthony K. Ahiawodzi is an experienced Economist, Researcher and an Educationist. He obtained his First and Second Degrees in Economics at the University of Cape Coast (UCC), Ghana from 1980 to 1991 and went for his PhD Programme in Economics at the University of Strathclyde – Glasgow (Scotland), from 1994 to 1998. He also holds a Diploma Certificate in Education from the University of Cape Coast. 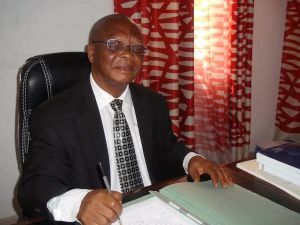 His Professional Lectureship career started at the Department of Economics, University of Cape Coast – Ghana in 1985, where he lectured in various aspects of Economics and Statistics from 1985 to 2002. He continued at the Central University College (CUC) in Accra for 3 years before joining the University of Professional Studies, Accra (UPSA) in August 2005. At UPSA, Professor Ahiawodzi served in various administrative capacities. He was the Head of Department of Marketing (October 2005 – December, 2008); Dean of Weekend School; a School which is his brain child (January 2009 to December 2012) and Pro-Vice-Chancellor of UPSA from January, 2013 to 17th September, 2015. Professor Ahiawodzi possesses a lot of experience in University governance and administration by serving on a lot of Statutory and Non-statutory Boards and Committees. At UCC, he served as Academic Counsellor; Hall Counsellor; Member of Faculty of Social Sciences Appointment and Promotions Board; Member of Faculty of Social Sciences Research Committee and an Associate Editor of Oguaa Journal of Social Sciences (JOSS). At CUC, Professor Ahiawodzi held the following University extension positions: Member, Faculty of Business Management and Administration Board; Accreditation Committee; Publications Committee and Library Committee. While at UPSA, Professor Ahiawodzi chaired the following Statutory Committees: Academic Audit and Review Committee; Board of Trustees of UPSA Provident Fund; Examinations Committee; Guidance and Counselling Committee; Industrial Relations Committee; Inter-Faculty Committee; Library Committee; Security Committee and Time Table Committee. Professor Ahiawodzi was also a member of a number of Statutory Committees at UPSA. These included: UPSA Governing Council; Finance Committee, Oversight Committee; Tender Committee; Academic Board; Administration Committee; Budget Committee; Joint Admissions Committee; Planning and Resource Committee, and Scholarship and Staff Development Committee. Appointment Renewal Committee of the Rector in 2011; Appointment Renewal Committee of the Pro-Rector in 2012; Grading System Review Committee; Investigations Committee and Disciplinary Committee. Bolgatanga Polytechnic (Now Bolgatanga Technical University) from 2007 to date. He was also the Founding President of the Institute of Certified Economists of Ghana (ICEG) from April 2009 to July 2012, and also a Fellow of the Institute. As an experienced Economist and Researcher, Professor Ahiawodzi has published many refereed articles in local and international journals. He has also authored four books in the fields, of Monetary Economics, Business Statistics, Managerial Economics and Macroeconomics, which are well patronised by students at the Universities, Polytechnics as well professional institutions. Prof Ahiawodzi’s research interest focuses on private savings, private investment, economic growth and development, financial markets, SME growth and Microfinance. Professor Ahiawodzi has also supervised many undergraduate and post-graduate Dissertations and Theses. He attended a number of local and International Workshops/ Conferences and Seminars in countries such as South Africa, USA, France and Germany among others. Professor Ahiawodzi was the Lead Consultant for a four-member team that worked very assiduously to obtain initial accreditation for LUCAS College, Dzorwulu, Accra and later became the first President of the College (2016 to 2017). It is hoped that Prof. Ahiawodzi will bring his rich academic and professional experience to bear positively on Knutsford University College to enable it attain greater heights. The core values of Professor Ahiawodzi are hard work, humility, patience and service to God and mankind.